The TraumaFix Sterile Medical Dressing is a new technology dressing that has been designed to be used on major bleeds during emergency care. The TraumaFix Dressing has been designed with increased pillow pressure, which helps to prevent blood flow and helps wounds to heal faster. 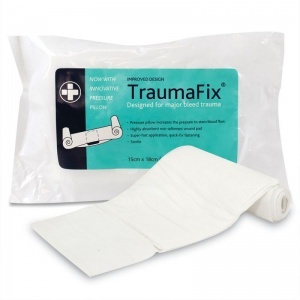 The TraumaFix Dressings are an ideal resource for any ambulance, paramedics or emergency services personnel to have on hand when dealing with major trauma injuries. These dressings contain a pad that offers a superior level of absorbency that is also able to apply needed pressure to a wound. This Medical Dressing allows for super fast application with the quick fastening bandage, allowing for the dressing pad to quickly stem major bleed injuries. This grants the medic attending to the victim more time to immediately treat any other injuries or monitor vital signs. The TraumaFix Sterile Medical Dressing comes individually wrapped to guarantee cleanliness when applying directly onto a wound. They are available in two different sizes depending on the needs of the user; please refer to the table below for more information. The TraumaFix Medical Dressing is usually dispatched via First Class Royal Mail and delivery should be within 1 to 3 working days.